This 320-round case of 30-06 Springfield ammo is high-quality army surplus ammunition produced in the 1960's for Pakistan Armed Forces. After a long period of dry storage, this ammo is now available for American M1-Garand enthusiasts looking for some solid practice ammunition. This 30-06 Springfield ammo is brass cased, Berdan-primed, and non-reloadable. These cartridges are topped with 150 grain full metal jacket projectiles perfect for slamming targets on the range. 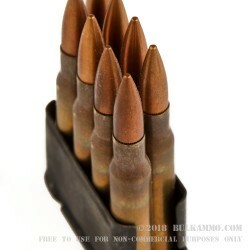 The ammo is packaged in convenient 8-round clips for easy loading. Don't pass on this opportunity to stock up on ammo for your favorite vintage gun. 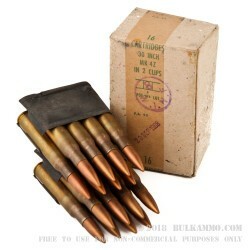 Order this case of 30-06 Springfield Pakistan Surplus ammo today! Took a few youngsters out to the range to shoot my "Relic" as they called it US RIFLE CAL 30 M1 SPRINGFIELD ARMORY you should have seen the smile on their faces when at 100 yards they were in the black with the first round. Pricing is competetive, delivery as promised. 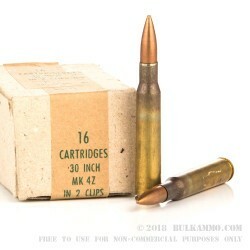 Great Valued Product and am very happy with the Ammo, came already boxed with clips. These little boxes that the 2 loaded clips come in are date stamped. The oldest I got was 1966 and the newest was1968. I love old stuff, which is why I collect military guns, and this ammo just adds so much more to my collection of arms and ammo. Q: Does this ammo attract a magnet? A: Hello Andrew! These 150gr. FMJ rounds in .30-06 are non-magnetic. 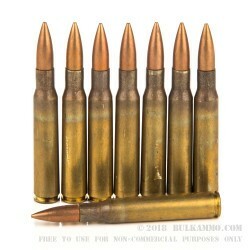 The bullet is a copper coated, lead core design loaded into a brass case.